Sadly, most of us grow up believing it's more important to fit in than to stand out. But there's something different about you... and it matters. 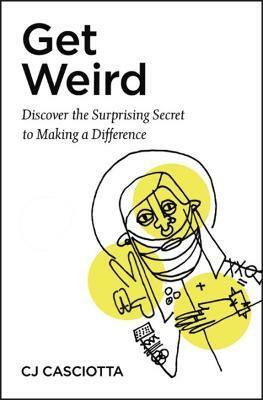 What if your weirdness was the key to changing everything? What if the outrageous, imaginative, crazy ideas that live inside your wildest dreams are actually there on purpose, divinely pre-installed to help others? Knowing what makes you weird is the best thing you can offer your art, your business, your friends, your family, and yourself. It's the essence of creativity, the stuff of movements, and the hope for humanity. Armed with the wit of a native New Yorker, whimsical anecdotes, and cultural insights, CJ Casciotta pens a manifesto for the oddball in all of us, one that will help you discover the surprising secret to making a difference. It's time to quit painting by numbers, conforming to patterns, and checking off boxes. It's time to GET WEIRD. A gifted poet who believes in the soul, CJ and his inspiring book teaches us gradually about our own special gift of weirdness and how it can help minds change and communities heal. It's a huge gift to read his stories and walk with him as he discovers that being a square peg in a round hole keeps you from sinking. You will be blessed by this work.--Becca Stevens, founder of Thistle Farms and Episcopal priest This soulful and practical gem of a book will kickstart your imagination and embolden your heart. While the message in GET WEIRD will stay with you forever, you'll for sure give your copy away to a fellow weirdo. Better buy two now.--Ian Morgan Cron, author of The Road Back to You Whip-smart and full of heart, it is a needed wake-up call, an inspiring invitation to be unusual . . . I can't wait to see all the goodness that's unleashed in the world because of this weird and wonderful book. CJ Casciotta is a writer and serial media maker passionate about helping people discover and own their unique identity or in other words, what makes them weird. As a writer and communicator, he's traveled all over the world inspiring communities like Lululemon, The Salvation Army, TEDx, and Charity:Water. As a media director and producer he's collaborated on projects with MGM Studios, The United Nations Foundation, and more. He created the popular podcast, Sounds Like a Movement, which has hosted culture-shaping voices like Seth Godin, Shauna Neiquist, and Krista Tippett. In addition, CJ's work has been featured by MTV, RELEVANT, Catalyst, and Q. A native New Yorker, he now lives in Nashville with his wife, Kelly, and his two kids, Selah and Mack.